This Thursday, 13th August PURE EVIL presents his first London solo show in two years at his Pure Evil Gallery in Leonard Street.The exhibition will feature a new series of 5 American Landscape Paintings and a series of Lost Innocence paintings. For those who choose to descend into the basement of the Pure Evil Gallery the show steps up a notch. 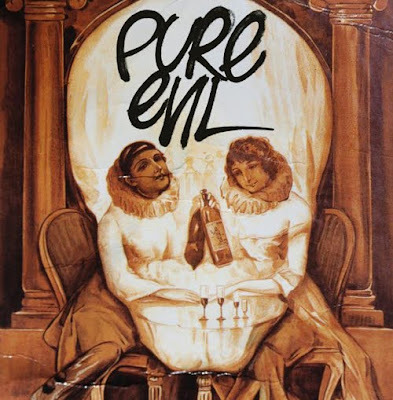 Take a trip inside the dark mind of Pure Evil . A kaleidoscopic journey through his psyche-delic headspace where images collide to create an eclectic world of original artworks with a dark gallows humour . The show also incudes a live soundtrack of experimental music amplified on an unique hand crafted valve sound system. 6 months ago a fully equipped music studio was set up in the basement and this will be the first performance of music created by Pure Evil in collaboration with Prehistoric Man. Below is a short clip Pure Evil filmed and it gives you an idea of the scale of the American Landscapes series which will be on display. The exhibition opens 13 August with a Private View. Expect lots of fresh new art in the upstairs space, trippy art in the basement, very loud music played on a big wooden soundsystem and beers and jolly japes what more could you want!! See ye there.